Recently I received an e-mail from a lady whose name is joujouka. I have kind of known her because she is a delightful and skillful knitter and a lovely seamstress, so it was not difficult for me to find her at BurdaStyle and at Ravelry before introducing ourselves to each other properly. She wrote me that she made a PDF file pattern for my bag, which I've posted here, for her convenience, and kindly attached it to the mail. She wrote that she had no problem with me to put a link for downloading it in my blog too. I'm very thankful to her!! The bag is very simple and I've already shown you the dimensions in this post, but I think it would be a big help for you to have a PDF file that is ready for printing, when you casually feel like giving it a try. 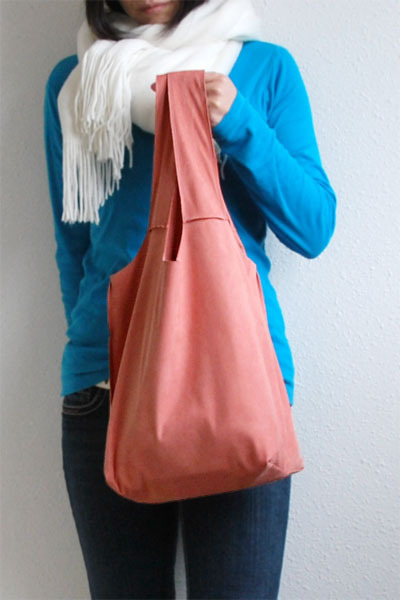 If you are interested in the pattern, download it from HatotoBag PDF pattern download. I'm sewing another bag for my sister right now. It looks pretty so far. 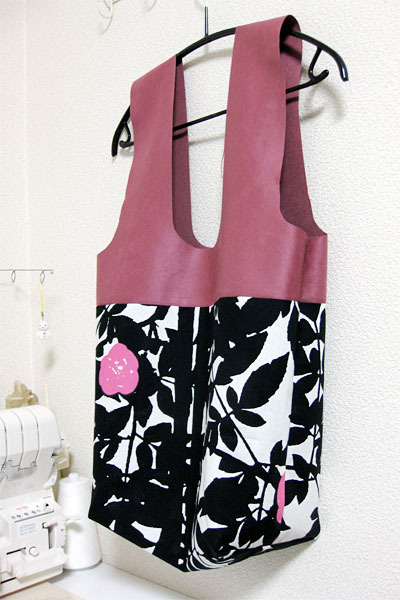 This is the lining(^_^). I hope she will like it! P.S. Before you ask me about the name, I start self-murmuring. It is one of the words that me and my family frequently use especially when we are so happy and have nothing special to speak. It sounds very silly and means nothing. And actually means everything too. It's getting warmer and warmer day by day, but spring seems staying far away from us. I wanted a new spring coat to cheer me up, and sewed two copies in a row. I mean, I sewed two coats from one pattern, and the first one turned out to be a failure and second one successfully became my spring coat. I sensed that it was going to be very unsuccessful from the beginning. It sounds very silly, but it is true. Though this mint green fabric had a right thickness for spring coat, I knew it was apparently springy (well...I'm not joking or rhyming). I just loved this color too much! What I did was wishing it OK, instead of being clever. I sewed it into a boxy coat, and the result was a disaster. It didn't seem that disastrous on a hanger, but it started barking its true meaning on human. It was like a shape-memorized very boxy container for human torso. I also thought I looked like a mint-green tin robot. (My daughter said that I looked like an astronaut in it, but I suspect she wanted to mention space suits.) I'm laughing at myself seeing that I just couldn't avoid the whole process to make sure of the consequences. I assume that it is good to share my failure that had caused by a bad choice of fabric. You have to see it to minimize your possibility to look like this, don't you? My suggestion is that if you doubt whether your fabric for coat is soft enough, you'd definitely better stop. So I came to my stash again, and after a long thought, I picked up this linen for the second attempt. It was a very heavy linen canvas, with generously flowing texture. By then, I became to hate all springy things in my stash, and naturally felt like choosing the softest fabric among all my coat-weight fabrics. It was a small piece of linen with a big pattern, which was a present from my friend Kapo, who is always bringing me one new fabric after her holiday. She is so nice. She is super nice. I can bore you by telling this thousands of times. Maybe now I have to have my own holiday to get her something nice. 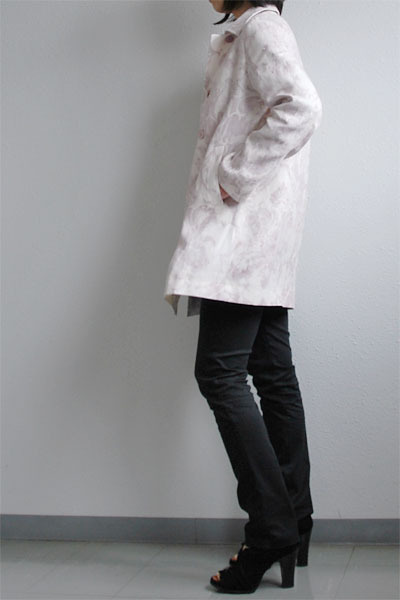 Thanks to its softness, this time it made the coat very wearable. 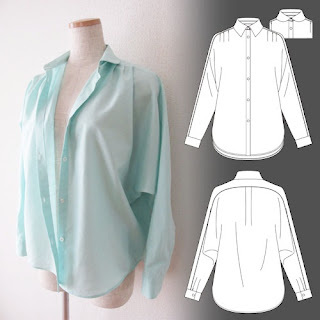 It slightly but naturally follows the shape of body and looks more decent as a garment, in my opinion. I couldn't care about the layout of print pattern, because of the size of fabric, but I am quite happy with the result in the end. I also chose a set of pink delicate shell buttons for it from my drawer. They were a part of swapping gifts from Mimosa some years ago. Thanks Mimosa, now they are on my brand-new coat! cotton/polyester blend, light weight, chambray twill, soft but very springy. 2.2cm buttons. linen, heavy plain rough canvas, soft, wobbly and flowing texture. 2.5cm buttons. Both are fully lined. 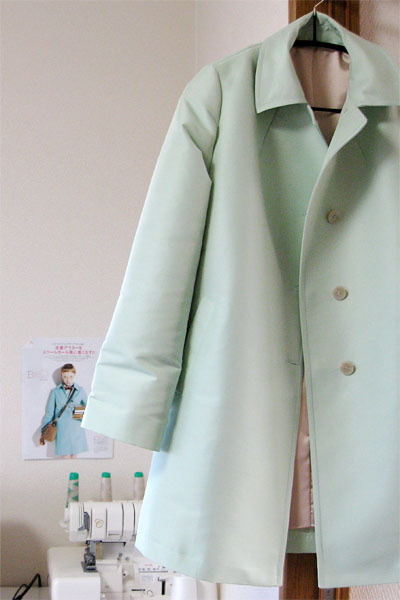 Mint green one has a closed lining. Lining of linen one hasn't been closed at hem. 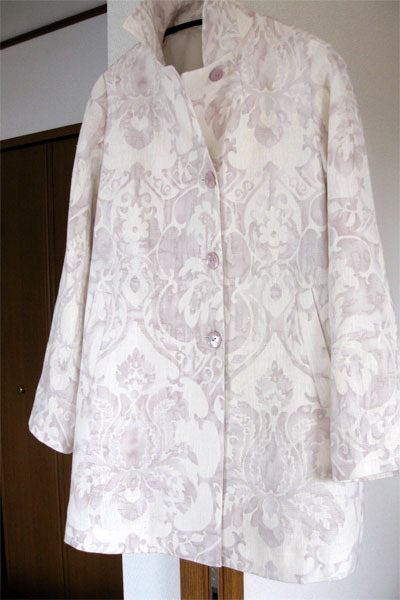 Linen coat has a narrower overlapping at front center (by 3cm). *Always choose softer fabric than what she'd think appropriate. *Never listen to yoshimi for her favorite. Yes I'll have a go. To confess, it seems difficult for me to take a picture of my outfit everyday, but I've decided to do my best. Visit Zoe's blog if you aren't familiar with her marvelous Me-Made-March '11 project, there you'll see a big number of us joining it. You may read my old posts here and here related to my past (pseudo) project as well. 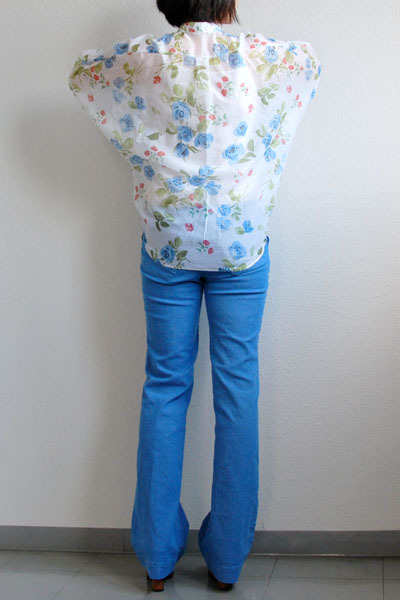 I sewed a pretty blouse. This is made of very fine light-weight cotton, and it surely seems good for spring wardrobe. Although neither the fabric or the print was very unusual, the construction of this blouse was somewhat unique. It has got a set of dolman sleeves with a long shoulder yoke which extends to the hand cuffs. I'm showing you my flaps. Aren't they cute with this flowery pattern? The thing is, I'm not a good shirt wearer. However, sometimes I feel I look OK in some casual types of blouses and shirts. (On the other hand, I'd look rather stupid and awkward in nice, formal, and traditional shirts. I'd also feel like that I'm borrowing someone else's clothes in that case. Very sad!) So I chose dolman sleeves and omitted collars to make it even more casual. I think now it's very wearable to me, yes I like it very much! I also made a pair of pants, in a cotton denim, too. Haha, I can hear what you say. The color of the fabric is very blue. And it is, you are so right, a funny color. I suppose it's the one of the colors which remind us past ages. Anyway, I liked it because of this interesting color. 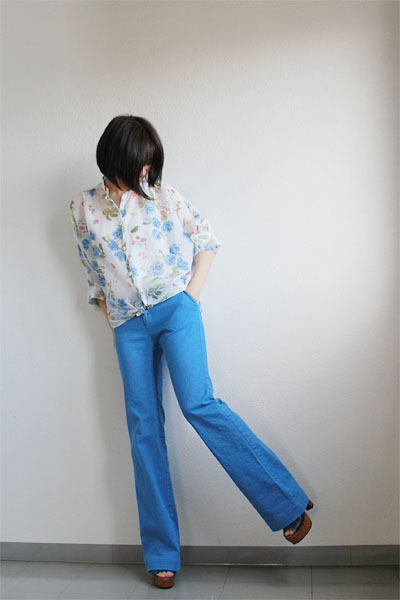 However, I will not be wearing the blouse and the pants together so often, because they are somehow and strangely matching too much well with each other, in color-wise, and it can make you laugh when they are present together. I think they can be worn separately and there will be no problem... Well, there has to be not! cotton lawnvoile, very thin, light, and soft. 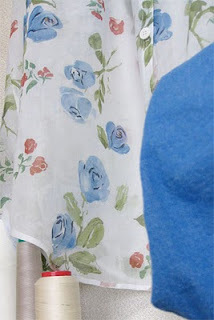 Blue flowery print. pants: lengthened by about 10cm. Hemming was done after hot washing and tumble drying of the garment. cotton stretch light-weight denim, soft, stretches well. It was sewn into pants before the first wash and shrunk to get a fit by hot-washing plus tumble drying.